Good morning! January’s almost over and February, with all its bitterly cold winds and icy conditions, is just around the corner. There’s something to look forward to! 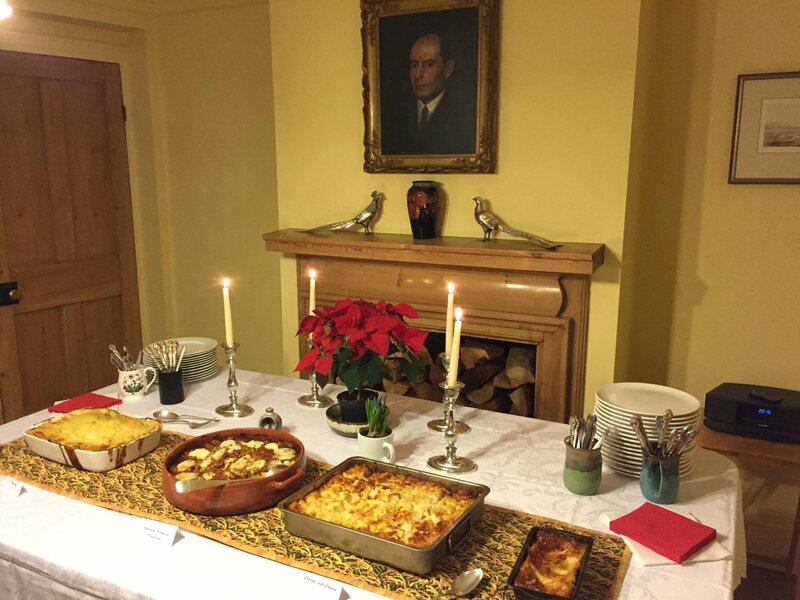 This week we have mainly been preparing for and then surviving Penelope’s latest master chef masterpiece – a dinner party for 30+ villagers which was a huge success. Largely because I managed to stay mainly out of the way apart from vacuuming the house from top to bottom six or seven times. Those of you who are familiar with Penelope’s catering expertise will not be the least surprised to learn that the food on offer was absolutely delicious. Also, that she managed to produce three different main course options along with four or five dessert offerings. Unlike in the past, however, where Penny would usually cater for two to three times the number of folks coming, this time there are barely a few scraps left to tide us over for the next couple of weeks. Either she has cut back or the villagers who came along ate like gannets. I think the latter. Sadly, I was too busy pouring drinks to get any decent photos so only have the following to share with you taken just as the tin foil was taken off each dish and before the gannets could get their hands on it. We have Fish Pie (oh my goodness, it’s good), Aubergine (eggplant for our American readers) Parmesan (absolutely delicious even though aubergine is hardly my favourite. Is it anyone’s favourite vegetable, I wonder? ), Lasagne with Chorizo (perhaps the best lasagne available anywhere in the civilised world) and, for our gluten-free friends, a small dish of gluten-free Lasagne with Chorizo. Of course, there was also a green salad, garlic bread and one of our guests kindly brought along a batch of freshly-baked bread rolls! Absolutely gorgeous. Not surprisingly, everyone was complimentary about the choice of mains and most folks had at least two if not all three options. However, I think they were left more or less speechless by the variety and gorgeousness of the dessert options. Sorry, no photo but they included Pecan Pie (with my sole contribution to the festivities – Liquorice Ice Cream), a Lime and Polenta Cake, heaven’s own version of a Cream Cheese Cheesecake (with fruit, of course) and a Chocolate Chip Brioche Bread Pudding with Rum Sauce. OMG! I have to say, the bread pudding was the size of Lancashire yet it disappeared in a heartbeat! Was it the rum sauce, do you think? It was a great evening and everyone went home merrily contented. All that was left for us to do was to spend most of Saturday washing up and trying to return the house to something approaching normalcy. We’ll have to do that again some time! On Saturday evening we dragged ourselves across the road for a Quiz Night in the Village Hall. As usual, the folks who asked us to join their team only discovered their mistake once the quiz had begun. It’s nice to know that we still give the illusion of being tolerably intelligent but our teammates soon discovered the reality. Our only contribution was to exclaim, “Oh, damn! I knew that!” just after each answer had been revealed. I guess some of you were able to witness the Super Blood Moon Wolf Moon Lunar Eclipse or whatever it was at the end of last week. Naturally, we didn’t see anything of it at all. Not only do these sorts of celestial events seem to occur at some ungodly hour of the night or early hours of the morning (with all the technology we have these days why can’t they stage these events to occur at a more reasonable time), the skies in the UK were, once again, almost universally cloudy. So, we have to rely on others to provide photos of these marvellous natural occurrences. These from the Guardian. We’re greatly looking forward to the return of our Chinese family late Monday evening. They’ve been in China for three weeks visiting with Ava’s folks and her sister who has recently (as of a few weeks ago) produced another child, a second Chinese cousin for Jessica. We think they’ve had a good time judging by the photos and messages we’ve received in the interim. And, although we’ve enjoyed the peace and quiet it will be wonderful to have them back again and to be exhausted by the two and a half year old! Did you, by any chance, read about the couple from Northern Ireland who are seeking compensation after claiming to find a crew member in flagrante in their cruise-ship cabin? In some contexts people would pay for such entertainment.